How do you develop the most effective learning method? I practice a rigorous habit of on-the-job training. I learn from the people around me – our clients, vendors, Chief Learning Officers, my team, anyone and everyone. I surround myself by the very best at work, and I listen to my team and invite them push to me to my full potential. I’m 100% committed to lifelong learning, and I have a voracious appetite for continual improvement. I’m a big believer that this in itself has driven my success thus far. I recently started a debate on learning on the site LinkedIn (www.linkedin.com). A great many of the respondents stated that they found “on-the-job training” to be the most effective learning method. Others stated that a mix of methods worked for them depending on the learning outcome, but for all respondents, on-the-job training was considered critical. Of course, this is not a new concept and has long been revered as one of the most effective means of learning. In the words of philosopher, Aristotle, “What we have to learn to do, we learn by doing.” On the other hand, on-the-job training can be risky. There is always the potential for employees to make mistakes, mistakes which can be costly for the company. However, as the most successful African American woman, Oprah Winfrey points out, mistakes can be learning experiences too: “What I know for sure is that behind every catastrophe, there are great lessons to be learned.” Better to avoid catastrophes where possible, but at least if it happens, there is the potential for a silver lining of learning. At NetCom, I have made mistakes, but I try to learn from them. Classroom learning includes physical classrooms and virtual classrooms. I’ve always found classroom learning to be most effective for me – partly because I learn from my fellow students as much as from the teacher. When I went into business, I signed up at Dale Carnegie and NYU. Even now, I try to take three classes each year to continue to develop my knowledge. When I went into business for myself, I noticed that no matter how much I studied and tried, I was still making grammatical errors in my writing that made me look unprofessional. I tried quite a few different approaches before settling on coaching. For instance, I hired a professor from NYU to be my writing coach. He came into my office once a month and went over my internal communications with me. He helped me dramatically improve my writing within a few months. I also have a coach from Harvard who helps me to focus on my strengths such as leadership and strategy and develop my weaker areas to a level of “average” skill. 10 other CEOs and I have formed a sort of support/mentoring group. We meet regularly to share ideas and past experiences about business – what worked, what didn’t, as well as the current challenges we face. I also use authors and books as mentors. For example, I’ve been mentored by the book Good To Great by Jim Collins. Self-study has also been an integral aspect of my learning. Over the years, I’ve used all kinds of self-study to improve my learning. There are a variety of types of self-study, but I have found reading to be one of the best teachers. Over the course of the past 11 years, I have read more than 1000 management books. Each one has taught me at least one new snippet of information that has helped me to improve my business. Video/audio is another source of self-study learning. Last year, I spent approximately 500 hours in my car. That’s a lot of time that could have been wasted, but instead, I viewed it as a great learning opportunity, so I sourced audio learning to make sure I was making the best of my time stuck in traffic. I’ve also made use of self-paced e-learning, and I use webinars to help me further grow and develop as well. Most effective learners know how to blend the different types of learning methods to accommodate the subject matter at hand as well as the particular learning outcome desired. At NetCom, we created a blended learning method which utilizes all of the learning methods discussed above for our Sales Team. Each sales person has a mentor and undergoes regular coaching. They also participate in on-the-job training for 16 hours a month. In addition, they have the opportunity to experience learning in a classroom and are encouraged to take on all different types of self-study including reading and participating in our on-site book club. This blended learning approach has raised productivity by 20% which proves that companies which are also learning organizations have a markedly better chance of success in the marketplace. 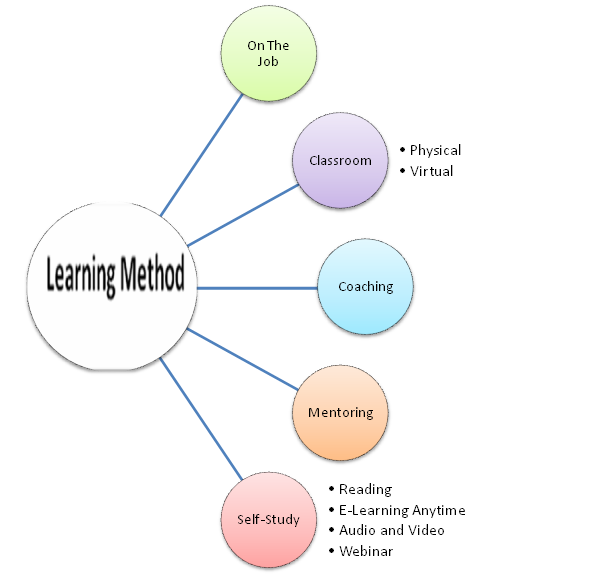 I have used mainly self study with extensive use of the internet and multimedia tools, with a high degree of success. In my opinion I think everyone has a different learning method that may work for them – for me, I always learned the most by talking to people, and researching/asking questions when I didn’t know something. For more detailed subject matter, I would probably do best in an open discussion environment, such as a classroom. As long as I have peers who have knowledge that I do not have, there is a capacity for learning.